Because it's Thanksgiving and all, I was idly googling for "pilgrim collar" (as you do) and I ran across this turkey. Oh, my lord. Now, as I read in Allure yesterday, the most threatening woman (to other women, when expressing interest in their partners, is this what science has come to? Really.) is one that has a high shoulders-to-hips ratio and a low waist-to-hip ratio, but this is not the way to achieve it. Not in corduroy, of all things. 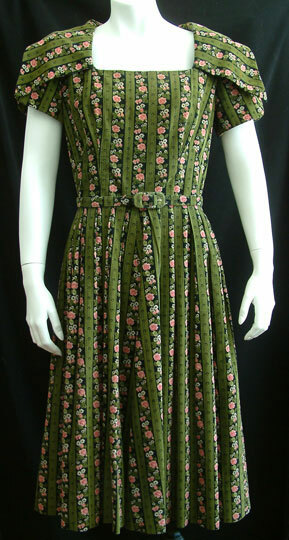 Maybe, maybe this dress would work in black satin, but in stripey corduroy? It just looks really, really odd. Anyway, if you think this dress is exactly what you need to make your Thanksgiving complete (and you have to admit it probably wouldn't show gravy stains! ), it's at Cosmic Cat Vintage Fun, and it's B36/W27; only $45! I have a piece of very similar fabric, but in deep wine red, that I am hoarding for the day I am asked to attend something for which I would I need a Very Important Dress. For really, if an event is not worth making a new dress for, is it even worth going at all? Speaking of which, last night I dreamt about a party (a very fancy cocktail-y party) where you came with the fabric and pattern for your dress and spent the whole party chatting with people while you all sewed together, and then you put it on to leave. I have no idea what that means, but it was a very pleasant dream! Check out this dress from Dandelion Vintage, which features three of my current obsessions: orange, paisley, and a wide midriff band. If this dress weren't way too small for me (B32) it would be MINE, as it is only $30. I don't know what it is about the midriff band, lately, but it's all I want to sew. I'm not even sure it's that flattering on me, frankly, but I don't care. This puts me firmly into the Diana Vreeland camp, I guess — people who are so in love with the IDEA of some particular fashiony thing that they don't give a damn how it actually looks. I do *hope* that it looks good, but when it comes down to a fight between my aesthetic theory and um, actual aesthetics, I'm afraid my (crackpot) theory will win out every time. After much urging I have broken down and bought that "Trinny and Susannah book" about what you really, really shouldn't wear. (I bought it on half.com for seventy-five cents, so it wasn't a huge investment.) I'm dreading reading it. I'm sure it will tell me to avoid full skirts and cardigans and bright loud fussy prints and suggest boring streamlined black dresses and low-waisted bootcut pants. Pants! I don't care if pants supposedly make me look better — I don't FEEL I look better in pants. I guess I shouldn't be worrying about what two (admittedly odd) British women might or might not suggest I might or might not wear until the book actually shows up, huh? Sufficient unto the the day and all that. Don't mind me. I'm just going to be over here, thinking about orange paisley. I have a habit (bad or good, depending on how over-quota I feel about my eBay purchases in a month) of putting things on a Watch List and then never, ever looking at them again. This one was one of the ones that expired … I'm not even going to link to the sad, sad "This Auction Has ENDED" page. I'm just showing you the picture. I do this a lot. I have lists and lists of delayed action items; what this really means is that I must do something immediately or it just doesn't get done. There aren't enough hours in the day! And if something isn't great enough for me to click "Buy It Now" or to place a real bid, it's not going to get bought. This dress is pretty great, though, and I'm feeling slight tinges of remorse, even though I don't usually make sleeveless or cap-sleeve dresses. And even though the cowl really demands a solid fabric to set it off — it would disappear in a wild print. 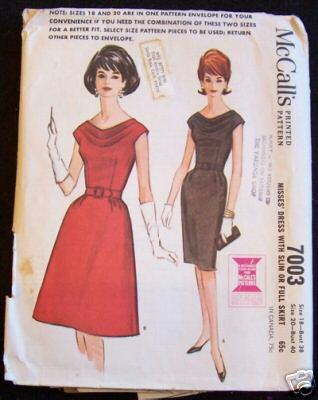 If I HAD managed to be on the ball enough to buy this pattern, I would have made it in a deep green silk shantung, with the A-line skirt. Oh, well. "For all sad words of tongue and pen, the saddest are 'It might have been.'" First of all (and I know I've ranted about this before), "classy" is a self-negating adjective. You can't describe something AS "classy" and have it BE "classy." It don't work like that, boyo! Except possibly to say somebody is "one classy dame." That's about it. Rose sent me this lovely dress — go click through to the eBay auction because the seller has almost obsessively photographed this dress. I know newborn babies who have spent less time in front of the camera. It's the next best thing to holding this dress in your hands, seriously. Check out the bodice. In the "too much is never enough" category, it wins hands down, being sweetheart AND surplice AND double-bowed. It's gorgeous, if a little on the small side (26" waist) and a Buy it Now for $325. Check out this ad from the NYT of 29 December 1929. I love the headline! Sorry it is so huge and slow to load … if you want a huger version, click on it for full-page.